We were the only two teachers in the room. 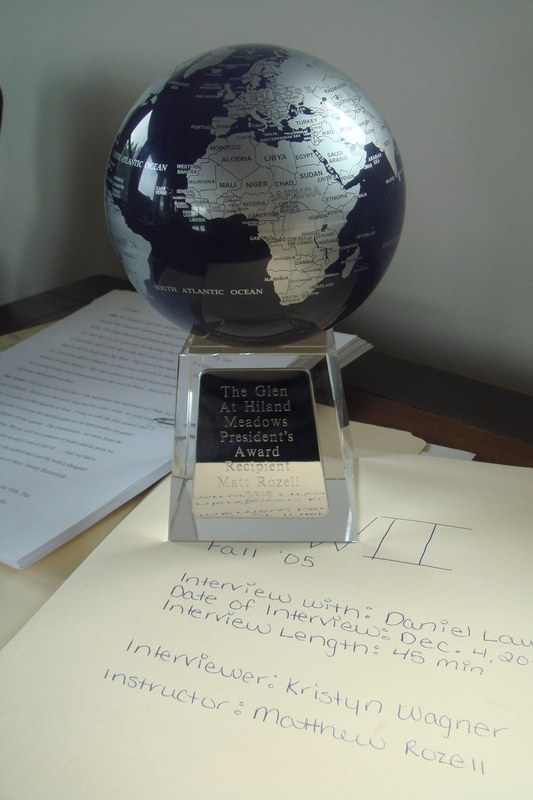 Last week I had the honor of being the recipient of the Glen at Hiland Meadows President’s Award. For the last several years, my twelfth graders have interviewed this retirement community’s residents. One student is paired off with an individual whose life story is then documented by the student. An interview is conducted, transcribed, and then researched; a paper is produced that adds an important aspect of the story of World War II and the Great Depression to the historical record, a story that otherwise would have been lost. One copy is then sent to the state archives. The kids and the elders bond and learn a great deal from each other. My kids have produced two hundred plus folders of material and I am now in the process of sorting it all out for professional articles. I had no formal remarks prepared. On the way over in the car the principal asked me how many awards I had received in my career. Self consciously I said that I thought this was the ninth or tenth. I had told no one but my students that I was going to the ceremony, as I would be missing them on the last day. I did not tell colleagues and I did not even tell my own wife, herself a teacher. They work every bit as hard as I do. Instead they get collectively kicked everyday by the local paper. To my surprise, my wife had been contacted and entered the room to join us at a table that included a CEO, bank president, and health care executive. In the room also were board chairpersons, town supervisors, a school superintendent, Congressional staffers, judges, more bank presidents, other CEOs- you get the picture, the movers and shakers. They were very nice down-to-earth folks who seemed to relish the opportunity to step back from the office and network a bit with their peers. One of them leaned into the principal and me and asked what our take was on the daily articles, editorials, and columns slamming everything in the education profession. I knew right then what my remarks would be about. I thanked the audience but the first person I recognized was my wife- not just for her support, but because we were the only two teachers in the room (teachers could learn so much from networking like this, but instead she had to play hookey)! Then I thanked my principal and explained to the crowd that some of the most profound lessons can be found by allowing the teacher the latitude in the classroom to lead students on a journey of discovery that may not necessarily take the path of pretesting and post testing kids to death. I gave the example of a girl who interviewed a resident there, a grizzled Marine who survived many battles against the Japanese, including Iwo Jima, and lost quite a few friends in the process. She was amazed at his life story, but something he said had struck a discordant note with her- here was a man who questioned the decision to use atomic force against the Japanese (combat Marines in World War II generally will tell you that it was the best thing that happened, from the standpoint of their own existence). So I gave Jillian books, articles, papers, websites, and off she went to produce a 45 page paper about Ralph and the controversy surrounding the 50th anniversary of the bombing and the national displaying of the Enola Gay. A connection was kindled, a publishable paper was written, a scholar was born, and today Jillian is in journalism school. I don’t take credit for helping her find herself- she did all the work. But I know I won’t be getting the same results if I am turned into a “content support specialist”. While I recognize (and think I am pretty good at) my role as an assessment coach in certain subjects, I’m not a technician. I’m a history teacher. The new measures being instituted as a one-size-fits-all cure all by persons who are not even in the classroom are myopic knee jerk political fixes that will have the effect of killing opportunities like these for our students. My senior elective which brought me to this awards ceremony and many others will likely be dead on arrival for not conforming to some narrow minded political quick fix. This class is not broken, but it will be killed off if it does not conform. And forget about bringing in World War II and Holocaust survivors to offer their life changing stories to the student body. Teachers are already scared to death to leave their classrooms. Shame on us all for allowing this. Personal responsibly and moral efficacy can’t be legislated- but they can be modeled and emulated. What better way to strengthen our national fiber, restore pride in ourselves and draw courage from the lessons of the past than to charge a young person with preserving an older American’s story? The talk was well received. Maybe I got to teach another lesson today. Fact is that some of the most powerful ones are unscripted. Matt, Congratulations on the well-deserved recognition and opportunity to share the value of educational lessons, stimulating students with a curiousity and respect for life beyond the walls of home and classroom and out side the box of “teaching for tests” that has become so widespread. I enjoy your website from afar, and very much appreciate what you are doing in my “home” area. Debbie S.
I have nominate you for a Versatile Blogger Award. I like your site.